Fab Nobs Theatre Inc have once again produced a Fab production. Little Miss Sunshine is a musical based on the 2006 movie of the same name. The story follows a family who travel across America in a VW camper van so that their daughter may enter the "Little Miss Sunshine" beauty pageant. Fab Nobs Theatre's brilliant cast take the audience on an emotional rollercoaster from belly laughs to tears to heart warming feels, all through the sensational directorship of Peter Roberts. The powerful voices of Ash Cooper, Stephanie Powell, Will Sayers and Sean Thomson through musical director Sally McKenzie are able to generate West End standard harmonies in the small auditorium space available. Robert Harsley gives a hilarious portrayal of the loving grandpa who isn't as sweet and innocent as one might expect a grandpa to be. Though the star of the show has to be 12 year old Jazzy Devlin. 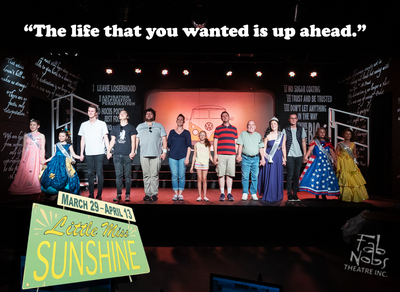 Playing the role of Olive, Jezzy's portrayal of Little Miss Sunshine's lead character will warm your heart and fill you with laughter. Congratulations to the entire cast and crew of Fab Nobs for yet another fabulous, must-see production. Another 5 star review from the Kid Town Melbourne team. It is worth mentioning that "Little Miss Sunshine" is not in any way connected to the Mr Men series. This production contains adult language, drug references and scenes of a sexual nature. KidTown Melbourne would suggest the production is not suitable for children under 13 years old. Tickets start from $29pp.